Fracking Hits Milestone as Natural Gas Use Rises in U.S.
More natural gas in the U.S. is coming from wells that have been hydraulically fractured than ever before, and fracking’s share of the country’s gas supply is continuing to rise, according to new data from the U.S. Energy Information Administration. At the same time, the fracking boom in the U.S. has led to a major boost in natural gas consumption, and for the first time last year, natural gas contributed about the same level of greenhouse gas emissions as coal, the globe’s largest single source of greenhouse gas emissions driving climate change. Sixty-seven percent of natural gas produced in the U.S. came from fractured wells in 2015, according to the data. That represented a total of 53 billion cubic feet of natural gas per day, up from 50 billion cubic feet in 2014. In 2000, only 3.6 billion cubic feet of gas came from fractured wells — roughly 7 percent of total U.S. natural gas production that year. About a third of the gas produced in the U.S. is used to generate electricity. 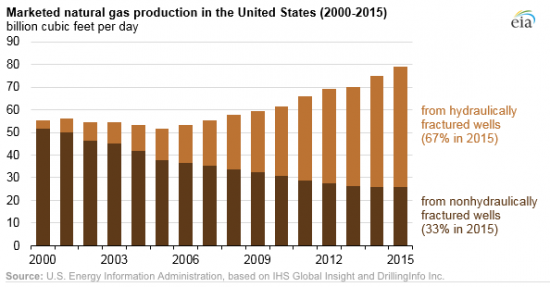 The natural gas and crude oil production boom over the last decade was enabled by fracking — the process of injecting large amounts of water, sand and chemicals into wells at high pressure to release crude oil and natural gas locked within solid rock, usually shale. The boom led to the U.S. becoming the world’s largest producer of oil and flooded the market with natural gas, driving down prices. That encouraged utilities to build more electric power plants that run on natural gas instead of coal. The shale gas boom is one of the main reasons that more electricity was generated with natural gas than coal for the first time last year, and 2016 is poised to be the first full calendar year that natural gas is expected to eclipse coal as the nation’s chief source of electricity. Though natural gas emits about half the carbon dioxide emissions as coal, EIA data show that carbon dioxide emissions from the two energy sources have begun to nearly match each other in the U.S. as natural gas use spikes and coal consumption falls. Coal consumption in the U.S. emitted about 1.5 billion metric tons of carbon dioxide equivalent in 2015 while at the same time natural gas use emitted 1.48 billion metric tons of carbon dioxide equivalent last year. Even though emissions are now about the same, natural gas contains more energy and can power more homes than coal. Shale gas and oil production is also susceptible to methane leaks and possible groundwater contamination, concerns that led New York state to ban fracking last year. Methane is about 86 times more potent than carbon dioxide as a climate change-driving greenhouse gas over a period of 20 years. 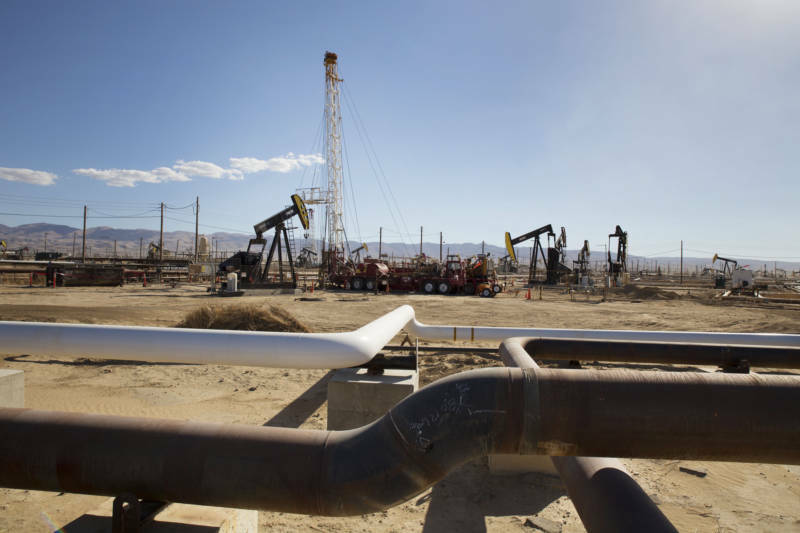 A Harvard University study published in February showed that the U.S. may be responsible for up to 60 percent of the growth in global atmospheric methane concentrations, possibly because of the nation’s shale gas boom. Reining in methane leaks from oil and gas wells is a top priority of the Environmental Protection Agency, which is expected to announce a new regulation aiming to control leaks from new oil and gas wells this month.